In Memoriam: We’re sad to share the news that Colonel De Stewart passed away unexpectedly on October 12th, 2018. He will be remembered fondly within the greater Cincinnati business community. Here is his story. If you’re reading this article, it’s safe to assume you know who Colonel Sanders is -- maybe you’ve even eaten at one of his fast food restaurants, Kentucky Fried Chicken. But you don’t know him as intimately as Colonel De Stewart does. After all, anyone can make plain ol’ chicken. It took Sanders 11 herbs and spices to make Kentucky Fried Chicken the most recognized name in fast poultry today. Inspired by the KFC mogul, Colonel De has been saving chicken, beef, pies, cakes, cookies -- you name it -- from flavorless fates since 2006. That’s when he and his wife started Colonel De Gourmet Herbs & Spices with just 15 items and two folding tables. “We would just take those around to wherever they’d let us set them up,” he says. The hard work quickly paid off, because today Colonel De has three locations (two in Cincinnati and one in Fort Thomas, Kentucky), 600 items including herbs, spices, blends, and sauces, and a newly opened restaurant. Like many of us, watching the Food Network convinced Colonel De he could be a famous chef. Some 20 years ago, the then-new cable channel gave Colonel De an idea. He thought, if he was having trouble finding these things, then other people probably were, too. And, like him, they were looking for one place to find everything they needed. But the Colonel wouldn’t enter the spice universe just yet. He needed to stick it out at his dead-end job in information technology, an industry he’d been in for over 30 years, to keep the lights on. That didn’t mean he couldn’t have fun though. The Colonel decided to pitch a cooking segment to the local public access channel in Northern Kentucky, Independent Cable Network 6. 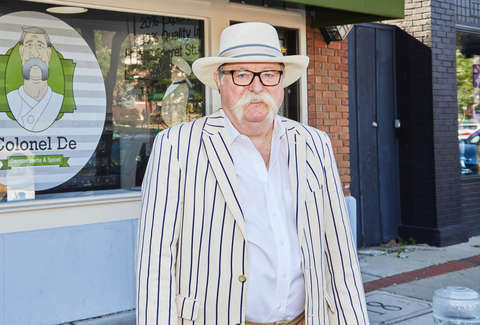 He didn’t think they’d go for it, but here’s the thing: Colonel De, affectionately referred to by customers as “the man, the myth, the mustache,” was made for television. His white horseshoe mustache takes up no less than one-third of his face. His thunderous laugh renders microphones superfluous. And his vast personal collection of suits and hats meant there’s no need for a wardrobe department. So when the Colonel got the call that ICN-6 wanted to move forward with the cooking segment, he couldn’t believe it. “I just thought, ‘Well, I guess it’s put up or shut up time,’” he says. The segment, where the Colonel was referred to as the “Businessman Chef,” consisted of Colonel De and a rotating cast of local culinary figures chatting about food and spices, hoping to get viewers more comfortable with using new flavors at home. Soon, viewers wanted to know where and when to get Colonel De’s spices. The Colonel’s path was clear: It was time to put up or shut up once again. Production and development at Colonel De’s is a lot different today than it was back in 2006, when the Colonel and his wife signed their first lease at the Historic Findlay Market in Cincinnati. “We opened [the store] with 100 items and I thought, ‘Boy, I got it now, man,’” the Colonel says. “You can’t come up and ask me for anything I don’t have. And the very first week, three people did.” But he adapted, and politely told customers that though he didn’t have an item just then, he’d work on developing it. Eventually the one store became three and 100 items became 600 -- but not without some professional help and business know-how. The business also works closely with chefs at the Midwest Culinary Institute in Cincinnati, a relationship that continues to generate new and creative tastes. When one of the MCI’s chefs called Colonel De complaining he couldn’t find any good tōgarashi (a Japanese spice) on the market, the team got to work. The result: the perfect blend, with just enough salt and not too much heat. Keeping track of the three tons worth of product and extensive catalogue isn’t as hard as it sounds though. Colonel De received a loan from Sam Adams’ Brewing the American Dream program, which paid for the business’s first group of iPads, allowing them to move off of pencil and paper and set up a database. With the rest of the loan money, they purchased a seed grinder. Now, instead of buying powdered ingredients (like cumin, for example, which the Colonel says atrophies quickly), he can buy seeds and grind them when needed. Keeping capital moving has always been a struggle for the Colonel, but he’s ever-determined to continue growing. “We have done every business expansion by bootstrap,” he says, including their latest venture, Colonel’s Kitchen & Catering, Stewart’s Fort Thomas restaurant that has seen a steady stream of customers since it opened in May. Menu items include the Flop (buttermilk pancakes with maple cinnamon butter) and Goetta Life (a biscuit sandwich with house-made goetta sausage, soft scrambled egg, tomato jam, and cheddar) among others. The featured item of the day usually highlights the same spice being highlighted in the retail store. Not sure how to cook with it? The Colonel can show you -- just like he first did all those years ago on ICN-6. 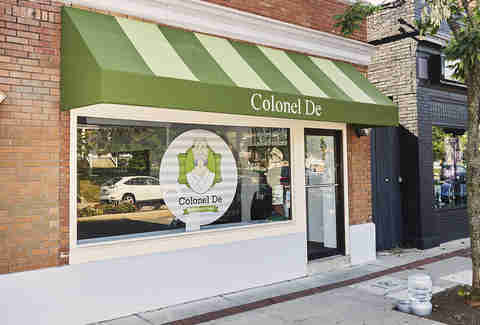 As for the name, Colonel De, it’s an official title given to community leaders by the governor of Kentucky. But you don’t become part of the Kentucky Colonels commission by making spices. The Colonel completed a nine-month leadership program in 1999, during which time he immersed himself in every facet of his community. He met with the heads of hospitals, joined a nonprofit board, even became involved with the arts. He learned to listen to the people around him and get them what they need. Today, that just happens to be really, really tasty food. “The relationship we have with our customer is the second most intimate relationship you can have,” Colonel De says. “I’m not going into their bedroom, but I’m going into their kitchen. I am helping to feed their family.